Multinational software company Autodesk has launched a multiyear research project with NASA’s Jet Propulsion Laboratory to explore new ways to design and build a spacecraft for long-duration space travel beyond Mars. The company said Tuesday it is utilizing generative design technology and its Fusion 360 cloud-based platform to help the agency build a new interplanetary lander for a journey to the moons of Saturn and Jupiter to seek signs of life. Mark Davis, senior director of industry research at Autodesk, said generative design combines 3D printing, CNC machining and casting methods. Autodesk said its tools already allowed JPL to reduce the mass of a concept lander’s external structure by 35 percent. 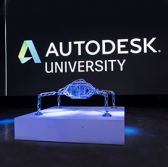 Karl Willis, Autodesk’s technology lead on the research project, said traditional design tools require developers two to four months to build a revised design, but the generative design technology cuts the process to two to four weeks.